Is Available For Shipment After January 1, 2019! This edition represents our 37th year in publication. Thousands of educational administrators ad transportation professionals use the information presented in our annual guide. Our book gives you access to the same value information used by most used bus dealers ad bus wholesalers in determining values when purchasing used buses. Yellow School Bus Book also presents a dictionary of Yellow Bus definitions, used bus evaluation procedure and forms, a listing of Yellow Bus manufacturers and contact information, and a Used School Bus Export Market Report. It provides you with a tremendous authoritative marketing tool to establish maximum prices and value adjustments in purchasing used school buses and trade-ins. It is the basis for book rates of depreciation for the yellow buses in your and/or client’s fleets. It allows you to fine tune your used bus sale prices for mileage, general specifications, condition, season and region. It offers an informative source of data giving insight into optimizing (year/miles) replacement timing of old busses. It indicates the types of school busses having the lowest and highest rates of depreciation. 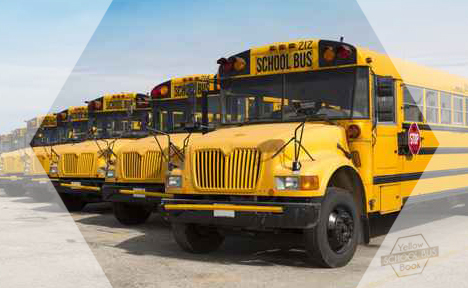 It provides information about current market trends and government regulations impact on future market values for used school busses.